Is the European Union on the Verge of Dissolution? And The Weak Suffer What They Must? Europe’s Crisis and America’s Economic Future. This book, just out, is a must read for anybody in any way interested in the history, the cultural identity, the present crisis, and the future destiny of the European Union. 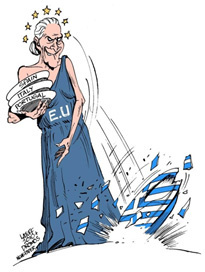 It is almost prophetic, a sort of Cassandra warning, predicting, but always rigorously logically and rationally, how the ongoing drama of the EU, of which he was a participant for a short while, will eventually end, and not only for Greece or the EU, but the whole economic global apparatus as presently constituted, unless urgent reforms and measures are adopted to remedy a deficit of Democracy and a lack of transparency. The author is well known. For five short months he was the flamboyant Finance Minister of Greece as the country attempted to negotiate its economic crisis. Contrary to general perceptions, he is not a Communist, nor a wild-eyed zealot radical, not even a Marxist. He is merely a rational economist, a European social democrat. The Anglo Saxon world would dub him a post-Keynesian. Before discussing the most interesting features of this extraordinary book, perhaps a short note on its title is in order. Its inspiration seems to have come from Thucydides’ famous statement as quoted above on the relation of power to truth and justice. 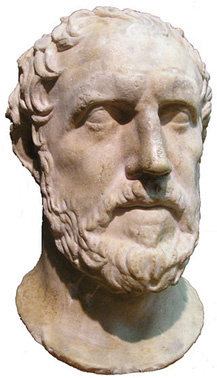 The very nature of war, as far as Thucydides is concerned, is dictated by the nature of power and how it determines who has the ultimate word. That is to say, might is right; the strong or the winner dictate the conditions of surrender, even the narration of events, and the weak accept what the strong impose. That’s the way things have been, are now and will forever be. Necessity dictates it. 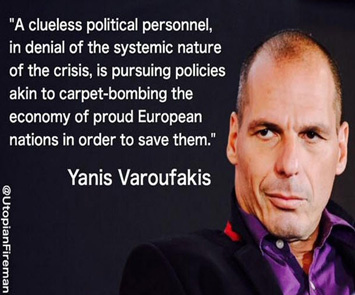 Notice however that Varoufakis has placed a question mark after the statement “And the weak accept what they must.” Without that question mark the title would have been a mere quote from the ancient Greek historian. With it, it becomes a powerful challenge to the misguided premise that the weak have no choice but to suffer in silence the abuses and the injustices of the powerful. In fact without that little question mark one may tend to misinterpret the whole spirit of the book. The general framework and assumption of the book is that the crisis in Europe is not over – if anything, it's getting worse and we are doing precious little to fix it, except advocate more austerity coupled with less democracy and transparency. 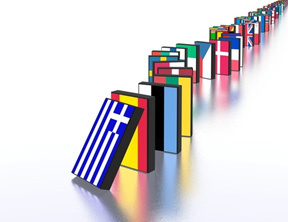 In this dramatic narrative which begins with Europe’s spectacular economic rise and ends with Greece’s spectacular fall which Varoufakis calls “the canary in the mine” being utilized by the EU bureaucrats, it is brilliantly demonstrated that the origins of the recent collapse go far deeper than our present leaders are prepared to admit; in fact they are complicit in the crisis. In 2008, the universe of Western finance outgrew planet Earth. When Wall Street imploded, a death embrace between insolvent banks and bankrupt states consumed Europe. 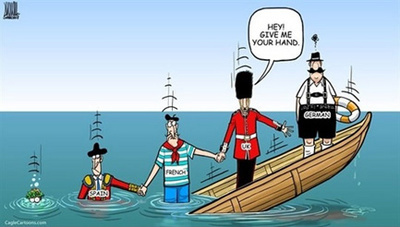 Half a dozen national economies imploded and several more came close. But the storm, the author writes, is far from over. From the aftermath of the Second World War to the present, Varoufakis recounts how the Eurozone emerged not as route to shared prosperity but as a pyramid scheme of debt with countries such as Greece, Ireland, Portugal and Spain at its bottom. Its woeful design ensured that collapse would be inevitable and catastrophic. But since the hurricane landed Europe's leaders have chosen a cocktail of more debt and harsh austerity rather than reform, ensuring that the weakest citizens of the weakest nations pay the price for the bankers' mistakes, while doing nothing to prevent the next collapse. Instead, the principle of the greatest austerity for those suffering the greatest recessions has led to a resurgence of racist extremism. Enter the likes of Trump and La Pen, as Varoufakis mentioned at a recent lecture in Washington State: Fascism always follows in the wings of economic corruption. And so, once more, Europe is a potent threat to global stability. 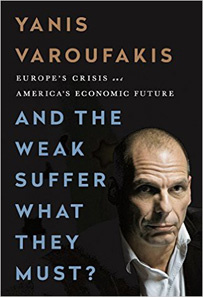 Drawing on the personal experience of his own negotiations with the Eurozone's financiers and offering concrete policies and alternatives, Varoufakis shows how we concocted this mess and how it may not be too late to save capitalism from itself. Varoufakis points out that in a true democratic federalism political unity would be in tandem with monetary unity. 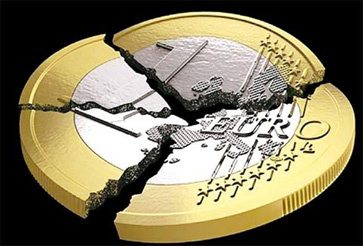 Not only there is presently no economic and banking unity, never mind social solidarity, but there is no federalism and little democracy and transparency, which were the hallmark of the EU at its origins as envisioned by its founding fathers and sadly it is now in deficit. The EU institutions in Brussels so cherished by Germany’s interior minister and seen as the targets of terrorists and non-democratic regimes such as Putin’s, are not themselves models of democracy. Most of them in fact are not in Brussels but in Frankfurt, the banking capital of Germany and the de facto capital of the EU. 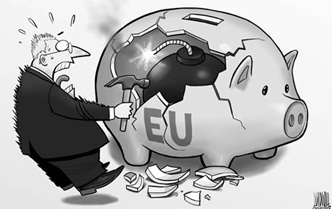 But the solutions to those deficits, which are fundamentally cultural and rational requiring a genuine knowledge of the European identity and its ideals, cannot be activated or even considered as policy because those making major economic decisions in Europe are not elected, often hold secret meetings, and automatically side with policies that favor Europe’s banking community. The book has essentially one message: The Europe we have today is only a currency union, but what’s needed to address a crisis like the one that hit Greece and Portugal and Spain is a European Union that’s democratically accountable, the Europe as envisioned at the outset by the EU founding fathers whose visions went beyond the merely economic. Varoufakis masterfully describes the institutions of global capitalism, how they were formed, how they were gradually deformed, why they were deformed, the names and faces of those who played a role, why we have the European Union, arriving at the conclusion that the central problem in Europe at this moment in history is a democratic deficit underpinned by the banks totally running things and devaluing the true cultural values and the very identity of Europe. For the ECB (The European Central Bank) it’s all about the money. So when Varoufakis, as finance minister, argued with the representatives of Greece’s creditors about how his country could not grow economically if all it’s doing is killing jobs to pay its debts, he discovered that the they, the ECB and Frankfurt, did not care a fig about all of that rational stuff. They just wanted their money. And the fact that he was making too many rational arguments cost him his job. The founding fathers of the EU must be turning in their graves. So Veroufakis, despite it all, remains optimistic about the EU and the global economy where we will all hang together or hang separately. Well he should, for the alternative may be to contemplate the abyss, and not just for his own people, the Greeks. But his Cassandra like warning has been sounded and sounded loudly. Let’s hope it has not been sounded to the wind. Let those who have ears, let them hear, for time is fast running out.